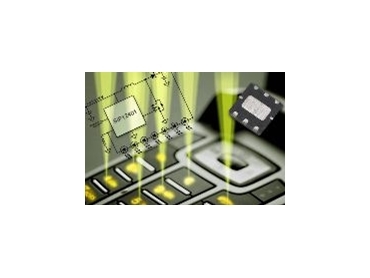 Minimum of external components required to support handheld displays with uniform, controlled brightness. VISHAY Intertechnology, represented in Australia by Braemac , has released two white LED drivers that deliver efficiency of up to 80% during operation in compact handheld and battery-operated electronics. The SiP12401 boost controller and SiP12501 boost converter are optimised to provide efficient, controlled brightness in applications including white LED backlighting for LCD displays in portable electronics such as mobile phones and digital cameras. The IC uses double-cell NiMH or alkaline and Li-ion batteries to drive white LEDs connected in series for uniformly bright backlighting without the need for ballast resistors. It supports an input voltage range of 1.8V to 5V. The SiP12501 is a boost converter IC for single- or double-cell NiMH or Alkaline battery packs. It is designed to drive white LEDs connected in parallel. An internal low-threshold power MOSFET allows the device to start up with a battery voltage of 0.65V. The SiP12501 accepts input voltages from 0.65V to 3.3V and regulates an output current up to 60mA from a 0.9V input. The performance of the converter is enhanced through thermal shutdown protection and anti-ringing control that minimises EMI. Both devices have a voltage-mode PWM design with internal frequency compensation to help reduce overall component count and enable the design of smaller, lighter end products. Operation in PWM mode with 600kHz switching yields high typical efficiency of 80% and 75%, respectively, for the SiP12401 and SiP12501. This provides prolonged battery life. The LED current may be adjusted externally for analogue control over intensity. Logic-controlled shutdown is provided with 1μA of standby current. The two LED drivers are available in a lead-free, six-pin PowerPAK MLP33 package and are rated for operation over the industrial temperature range of -40°C to 85°C.